We created this delicious chicken salad with spiced yogurt instead of mayonnaise. Wrapped in a hearty wheat tortilla stuffed with spinach, this wrap makes a satisfying meal. 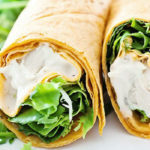 This chicken and spinach wrap is a healthy lunch! Place chicken in a shallow glass dish. Drizzle lemon juice over chicken. Season with salt and pepper if desired. Allow chicken to marinate for 30 minutes. Heat medium skillet, lightly coated with spray, over medium-high heat. Add chicken; cook for 3 to 5 minutes on each side, or until chicken is no longer pink in the middle. Remove from skillet. Slice and set aside. Combine yogurt with curry, garlic powder, paprika (if desired), and cayenne pepper (if desired) in a small bowl; mix well. Spread yogurt mixture evenly on tortilla, leaving about ½-inch around the edge. Add a side of veggies to make a great lunch.